What education have you taken? I graduated from high school in Swan River in June 2018. This is my first year at BU, and it has been a great experience so far. I will be working towards a Bachelor of Arts degree and I’m looking forward to the next few years at BU. What accomplishments are you proud of? During my education in high school after going blind, I began doing in-class presentations about blindness to all grades in the different schools in Swan River. In doing those numerous presentations, I have been awarded a few citizenship and leadership awards and recognition. There are also the scholarships I have had the excitement and honour of being awarded. But the biggest accomplishment would be not giving up after going blind. If I hadn’t had my mind set on finishing high school, learning to adapt to sight loss, and wanting to continue in education, I most likely would not be where and who I am today. I grew up in a small community north of Swan River, before actually attending school there. I lost my sight in March 2015 so it would be almost four years now. It was a difficult situation in the very beginning, and it was only a few months before I was originally supposed to graduate from high school. Being so close to graduating, I decided to adapt as much and quickly as possible to finish my education. If I didn’t have the drive to better myself in that new situation I would not be the person I am, or be where I am today without that drive, and the support from those around me. How did you become interested in your field of study? I always found psychology interesting, and doing this degree sort of allows me to dabble in the Arts while working towards getting my degree. But my “goal career”, and the master’s degree I plan to do afterwards help me in the decision. What is your philosophy in life? I am a person who plans things. Prior to sight loss, I had a plan of what I’d be doing for the next couple ears. Post sight loss, everything changed, and I came up with a new plan. Now, I tell myself and others: plan your life the way you want, but always leave some wiggle room because life can always throw some curve balls. Where do you see yourself in the future? My plan is, after this first degree, to go for a master’s degree which is in the area of vision science, after which I hope to be working with other visually impaired people. I would like to nominate Andrea. This young lady is in her first year at Brandon University, working on her Bachelor of Arts degree. Her ultimate goal is to graduate with a Masters, and gain significant employment at the Canadian National Institute for the Blind (CNIB). Andrea is visually impaired (legally blind), living in residence. Since September, she’s had to learn how to maneuver a whole new city, school, campus, group of people and living situation. She attended high school at Swan Valley Regional Secondary School in Swan River, relocating to Brandon to begin her post-secondary education at BU. 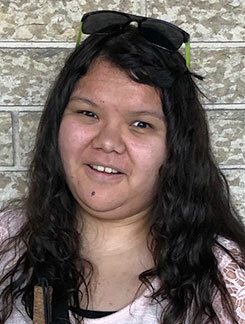 Andrea already is the recipient of many awards: Manitoba Youth Achievement Award, Manitoba School Board Association Award, Manitoba Citizenship Award, just to name a few. Andrea gives many ‘lived experience’ presentations for a number of organizations and institutions (including BU’s Access Awareness Week in December of 2018); she sits on accessibility panels, and she speaks with people who are interested in learning more about her experiences.